The fishing trip with Jeremiah was all the encouragement I needed, I thought I'd like fly fishing, now I know I like fly fishing, so I've been cobbling together some kit of my own. On a strict budget. Fathers day was keenly anticipated at the lair of the bushwackers this year, despite her much repeated (and dare I say ludicrous) claim that "You have more than enough fishing equipment to last a lifetime" Mrs SBW, SBW jnr, and The Littlest Bushwacker chipped in to buy me a fly reel. I'd got a fly line, travel rod (essential for the urban fisherman who travels by bus, train or scooter) made a rod tube for it and all I needed was the reel. There seem to be two rival camps when it comes to fly reels; first there are those who believe the reel is a place to store the line and then there are the advocates of 'low start inertia drags' who feel that no reel could be worth mentioning (let alone taking to the water) if its drag takes more than the weight of a single cigarette paper to spin into action and cannot withstand testing against the off the line acceleration of a 1000 cc sports bike. Fly reels are another of those guy things, like watches and firearms, where we go all misty eyed at the way metal has been worked, believing that the god of the forge and goddess of the hunt will somehow allow us special favour if only we drop a bit more cash, shave off another two grams and use some space age technology. Yeah right! I own a couple of Magnesium bodied spinning reels, sound great don't they? They're certainly very light but Magnesium is slightly porous, so they have to be coated in special paint, which can be scratched off. The same reels also have hype features which make them sound more 'technical', they have 'infinite anti reverse' sounds good but all it means is the spool only turns one way and the thing that stops it turning back has no play in it. Still 'infinite anti reverse' sounds more 'cutting edge' than 'it does what it's supposed to'. Enough already! Get to the Point! What's it like? Greys are a well known brand in the UK (part of the House of Hardy empire) and their missionary rods are for many people the default travel rod. That fitted in with Jeremiah's advice, and the price was bang on £30 too. So I put in my fathers day request for the 4 weight reel. As coincidence would have it during the writing of this post I was re reading an old copy of Field and Stream (Dec06-Jan07) when I saw the self same reel recommended. 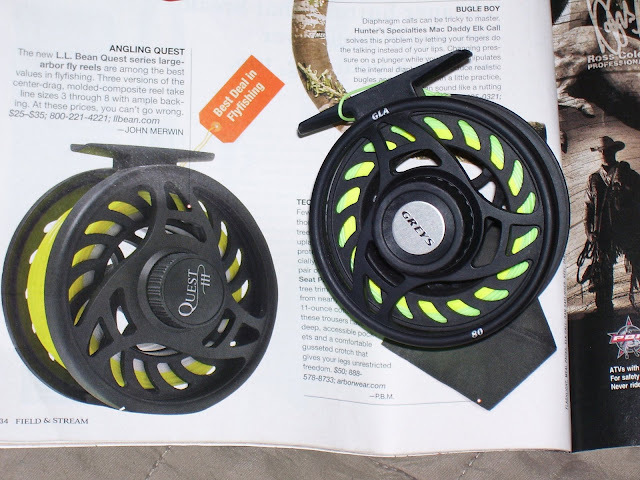 In the US LL Bean sell them as the Quest range - Loads cheaper $29-$39. The F&S guys gave it best for the money status. The reel is polycarbonate (gasp sacrilege) and here's for why. Aluminium is very easy to scratch even when its been hardened and as most of the places where I'm after those urban trout are in concrete canyons I thought a hard wearing plastic would be a better bet than a cheap aluminium. It's immune to corrosion and after all the heartache that I've expended over cleaning and rinsing those spinning reels I felt like getting something 'wash 'n' go'. I was tempted by a supposedly more up market version of the same idea in clear plastic, but it would have meant doubling the budget and I later saw this post on UrbanFlyFisher revealing the design to be 'mince'. I've caught big mean fish with reels considerably less refined than this one. In comparison Jeremiah's Orvis' were a lot quieter clicking - will that make a difference? Only time will tell. With cast plastics there's not a whole lot to go wrong, it isn't going to make you drool, but then my rods no great shakes either. The one area where the maker has really let themselves down is the cage and spool fit. Where the spool meets the spindle the fit is fine but there is a 2mm gap where the cage meets the frame of the spool. Most of the time its fine, but if you have the drag set quite loose, the line often appears on the outside of the cage. Which is not what you want. At all. I've been thinking of way to correct this and at some point I'll do a post called Pimpin - the GLA 80/Quest. Hmm where's that machine shop catalogue again....? Thanks for dropping by, leave some comments - I'd love to know what kit you're using and whether you reckon it makes any difference to the fish. PS F&S are still recommending this reel! Our friend who is yet to get his TLA (three letter acronym) lets call him jon, has just sent me this picture from his place in Italy. Apparently he was standing by his trout stream (you think that's jammy - he has Boar and Deer too!) wondering weather or not to take up fishing (I know! Some people!) when he saw this one had invited itself to lunch by marooning itself in a shallow pool. So he picked it up and took it home, as yer would!